Grey and Ray is a fun collection of kids apparel created by a love of surf, skate and California street style. Designed through the inspiration of our kids Benjamin Grey and Oskar Ray, Grey and Ray is all about a kid’s creativity and personality. Grey and Ray blends the edgy cool of street style with the fun and whimsy of California living. Grey and Ray's west coast inspired collection includes distressed t-shirts, sweatshirts and zip up hoodies emblazoned with hip graphic prints made for kids aged 5-10 years old. Benjamin Grey and Oskar Ray have a hand in product development and test all the styles and if they don’t pass “the kid test” it won’t be Grey and Ray. Each Grey and Ray style is easy recognizable by its 2 red X's representing each boy's stamp of approval. Grey and Ray hopes to inspire your kid to be their own "indikidual". Benjamin and Oskar met at preschool and became insta friends. As the boys grew, they were having a hard time finding cool clothing that felt good to wear and expressed their personalities. 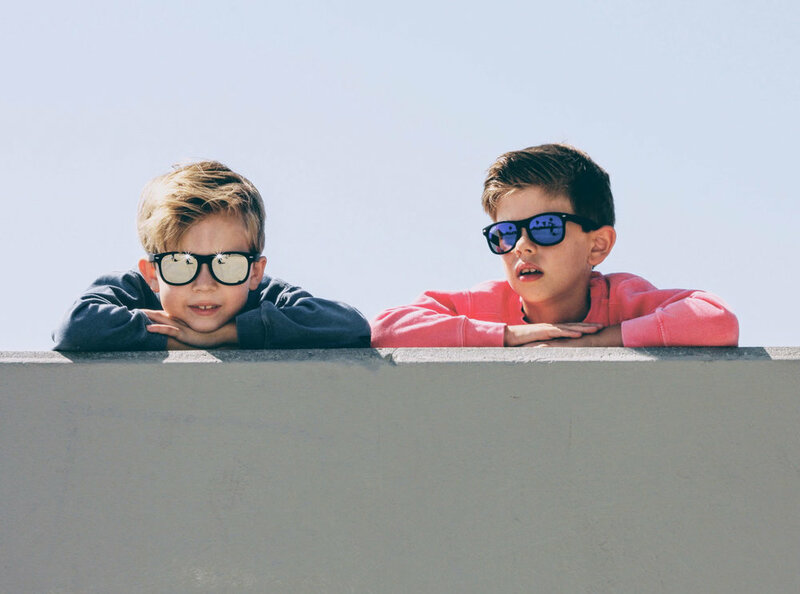 There are so many more options for girls than there are for boys so the boys together with their moms hatched up the idea of a West Coast-inspired kids clothing line that focused on expressing their “indikiduality”. Benjamin and Oskar are involved in all aspects of the design process. They choose fabric, color and style of each item and even paint splatter some of it. Benjamin and Oskar find tags in their clothing uncomfortable that is why Grey and Ray opted for a tagless label. Gudrun Kosloff, originally from Denmark, is a makeup artist in the fashion and entertainment industry. Her work has been featured in ELLE, Marie Claire and Harper's Bazaar and her list of clients includes Jennifer Lawrence, Ashlee Simpson and supermodel Helena Christensen. From working in the industry, Gudrun has a keen eye for design and recognizing the latest fashion trends. Heidi Lieberman is a former celebrity stylist and costume designer who has worked with such names as Heidi Klum, Rihanna and Eminem. For Heidi, style is an extension of her personality and mood. Her belief is clothing should make you feel good no matter your age!